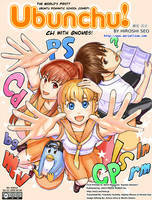 This is a custom-made Right-to-Left Instructional Insert for Ubunchu, an Ubuntu-based manga by Hiroshi Seo and recently translated into English by Doctormo, Fumihito Yoshida, and Hajime Mizuno. While featuring a sample page of the original Ubunchu manga, the overall design of the insert is based on the Ubuntu login screen, and features "Risa-tan", a chibified version of Risa (the "Mac Girl" from Ubunchu). Risa-tanis soft-shaded to blend better with the insert design. The insert is meant to be included in the "RtL" (="Right to Left") version of Ubunchu, a special reedit of the translated manga that I'm in the process of working on. Additional details will be posted later. And I find my attention being drawn to the small stuff as well-- even her shoes, socks and tie are wonderfully drawn! Her eyes are somewhat simple compared to what you normally draw, but they have a sort of cuteness in their simplicity. The cap I was surprised came out surprisingly well, since I only spent not but five minutes on it. [I was desperate to finish and go to bed, so I just slapped together some random reflections that somehow, in the end, formed a cohesive metallic surface,... weird... O__o ). And that cap came out amazingly for five minute's work. Nice job! And yeah, that cap, just like Puma-Chan Beam or the Amiga-C64 Portraiture, is what I call an Epic Sleep-Deprived Miracle. Hoho, since I started painting I've learned one big rule: don't ink or paint while tired. JUST DON'T. But I guess digital art is more forgiving to sleep-deprived mistakes (or triumphs). It's wonderful! I can't wait to post the whole thing completed! I read somewhere that you're hoping I might offer new translations -- while I'm hardly capable in terms of language translation, the literal script file you gave me earlier, plus a "what the hell, let's have fun" kind of spirit, let me try my hand at some rewrites. Nothing major, but I hope you like. Oh I wasn't thinking rewrites, I just thought you'd have ideas for making it more palatable and probably better English. For now, feel free to consider my current dialog in the SVG as my ideas put through the test. Well there are plenty of opportunities to contribute to the FOSS community in terms of art, creative talent and a new perspective on ideas. I've just pushed Revision 5 of the ftp and sources which include some of you new dialogue for the LtR readers. I've also updated some other text I felt could do with more smooth reading. I downloaded Revision 6 and spent the time changing all the pages to include your dialogue revisions. Oh, and not particularly keen on going back to drawing "pretty" wallpapers and icons, meanwhile things are falling apart all around me. Already have that happen thrice before, and along with time, money and morale lost, all my artwork became squandered and forgotten. That's great, a ChangeLog will make it easy for me to get the changes. And I can't wait to offer both versions so keep up the good work. I may create a bzr project for it on launchpad, do you know how to use bzr and launchpad? This will allow me to use some of the tools there and control it better, I could scrap the tar.gz and point people towards the version control instead. Your art is awesome, I'm very keen on seeing more of it. But I understand how time/money/inclination can change. I'm unemployed myself, and it's hard to know where to earn your bread any more. ...cause I'm a crazy old pig with too much ambition. But having any kind of hobby keeps me sane, so shouldn't complain anyway. Not unemployed now but used to be for quite some time -- back in the day when I had no hobbies or life, and was content wittling away my youth. I can at last vouch that that's not fun, and a lot would change if I could do it over again. I'm happy to see a chibified Risa-Tan! The helmet and the hair pin looks solid. You work really fine with Inkspace. And I'm surprised with your working on a RtL version of "Ubunchu! ".I really looking forward to it,too!